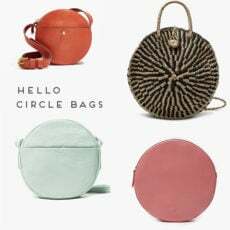 Usually, I carry around a big bucket bag filled with everything I can think of – wallet, sunnies, keys, hand cream, headache medicine, etc, etc. But sometimes a girl just needs to let go of the giant bag, in favor of a smaller cutch, right? Which is kind of why I love foldover clutches. 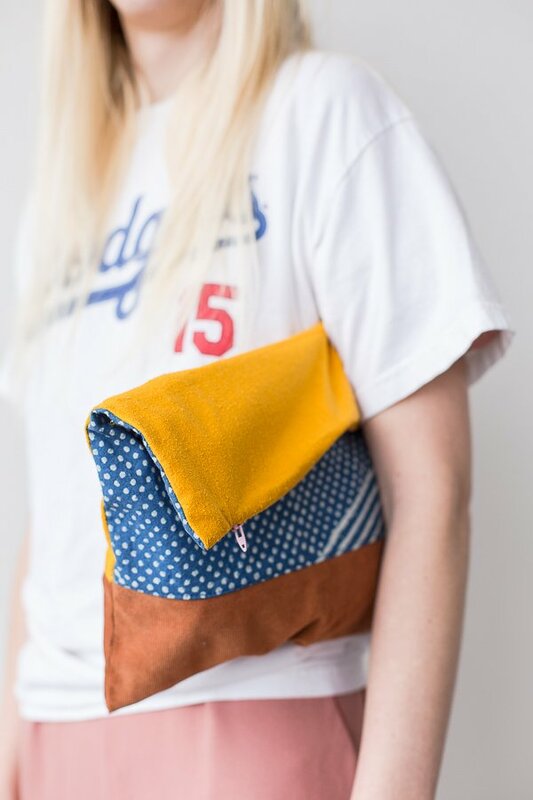 They have lots of room for my laundry list of carry-ables, but still look cool. Who’s with me?! 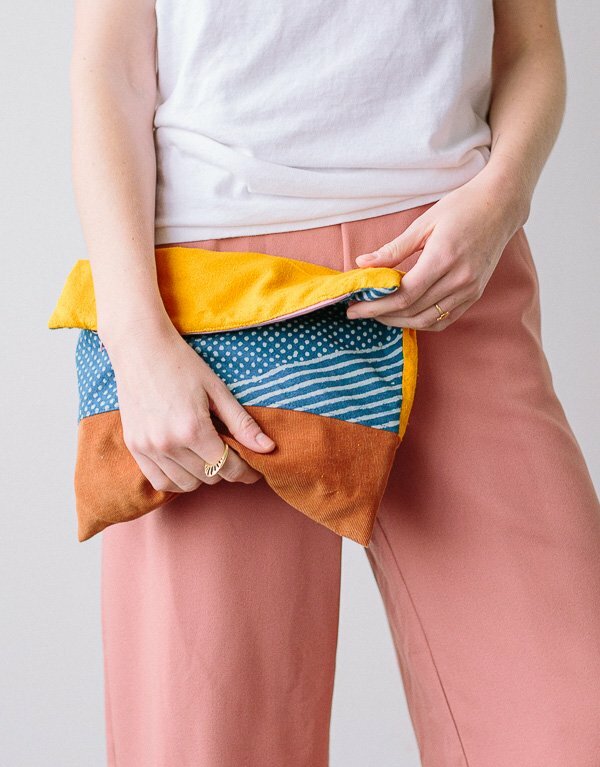 If you’re nodding rn, try this DIY foldover clutch with a double sided patchwork pattern that completely changes the look. 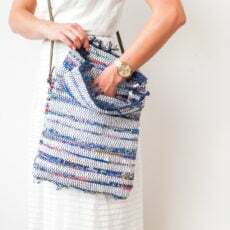 *Enough for a lined 12×12 clutch like the one pictured. 1. Choose the fabric you’d like to use. 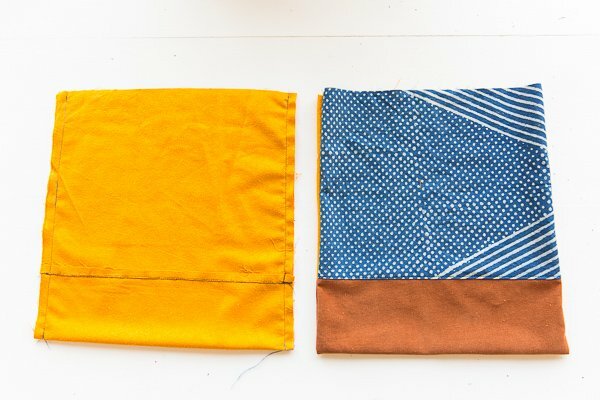 I went with 3 fabrics that worked well together (all scraps from other projects – with the exception of the indigo fabric, which is actually a fabric napkin leftover from this Father’s Day brunch). 2. For this clutch, we opted for one piece of fabric (brown corduroy) to run the full length of the bottom all the way around. So Julia connected the top side pieces to the brown bottom piece with a straight stitch to form one long rectangle. 3. Then fold the long rectangle in half, flipped inside out, and close the sides with straight stitches again. Flip it right side out again. This will be the outside of your clutch. 4. 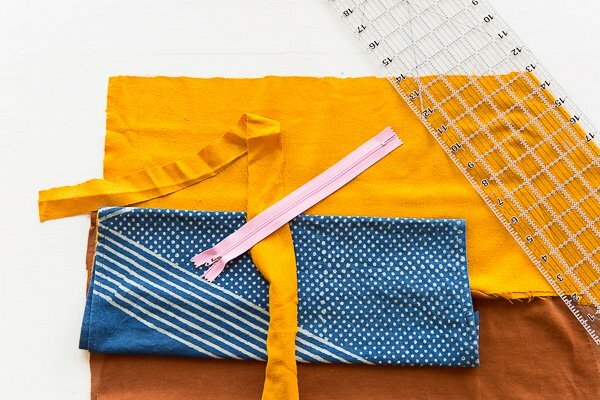 Cut one long piece of lining fabric to 13×25 inches, along with a stiff piece of fusible interfacing (if desired). 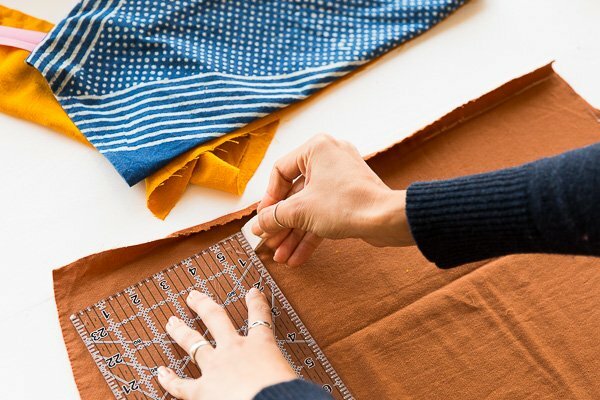 OR cut the interfacing to the same exact dimensions as the liner to stiffen the entire surface of the clutch (including the fold). 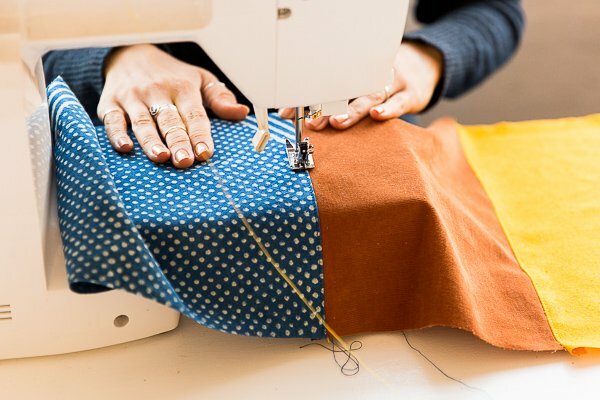 If using interfacing, attach to liner with iron, and then sew the sides of the lining closed with a sewing machine. Keep top open. 5. Insert the liner into the finished exterior pocket. 6. Then, place the zipper in the middle. If your zipper is shorter than 12 inches, like mine, you’ll want to make sure its centered on the clutch – leaving even room on each side. 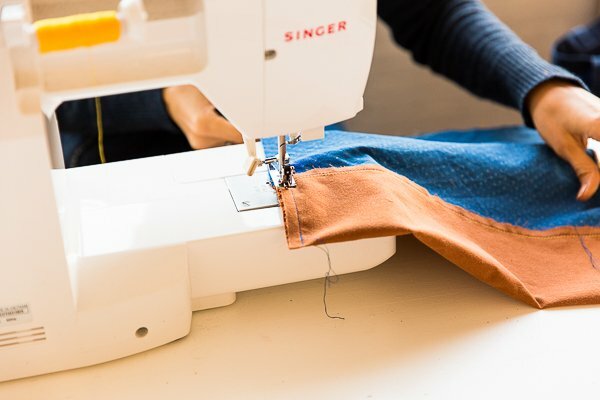 Attach the zipper to the edge of of each side, using a zipper foot, by inserting the zipper between the lining and the top / exterior of the clutch. Then finish the interior corners by hand. 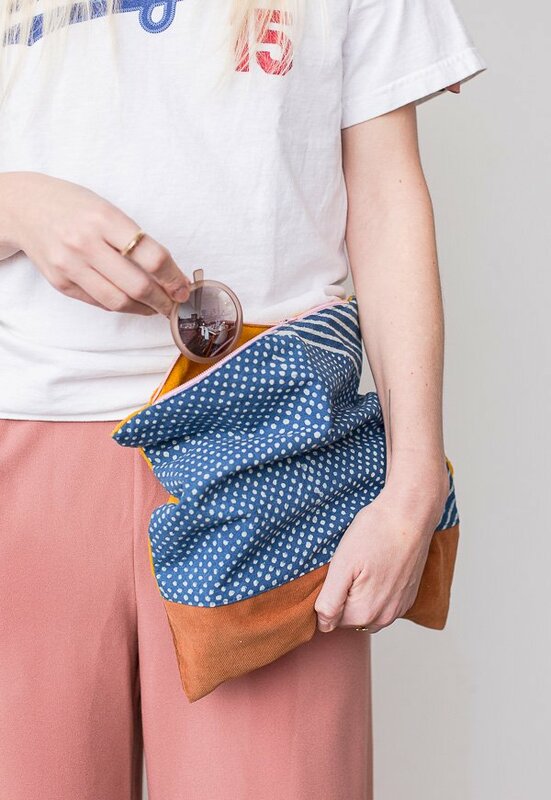 Assuming you use different fabrics on each side, when you flip the clutch to the other side and fold it over the other way, it has a completely different look. 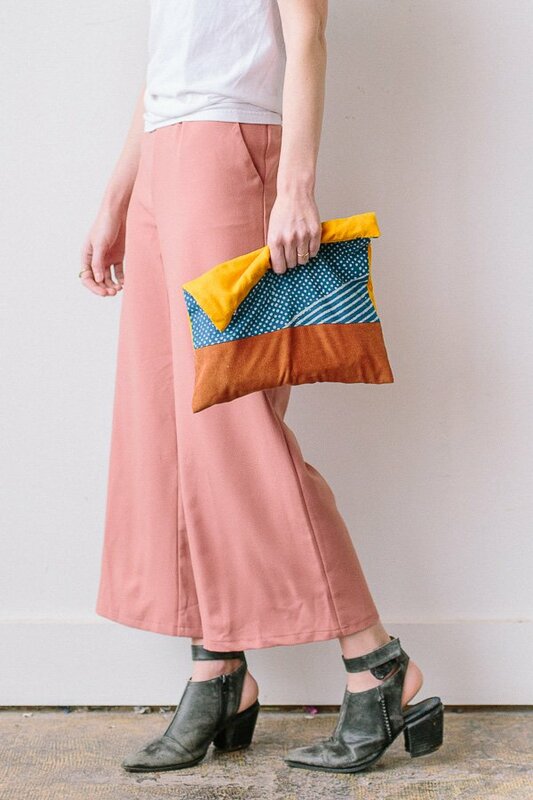 I also love the idea of using this clutch as a pouch for the office, if you can’t let get away from the big giant bag for a purse thing. Or even a makeup or pencil bag. So many options and you can change the size with just a few tweaks to fit your needs. Are you a clutch person? Yay or nay? 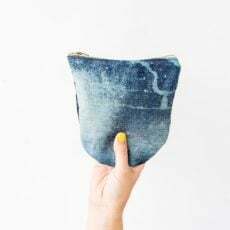 What do you think of this DIY foldover clutch? It looks so cool! Although those are not my favorite colors I love the pattern mix! Thanks Michelle. To each they’re own on the colors for sure. 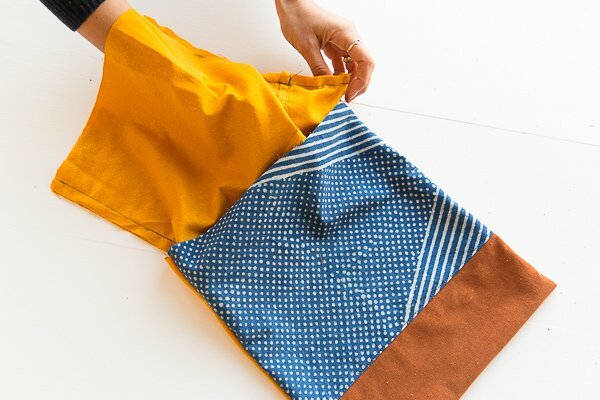 🙂 I just love that you can use fabrics scraps from previous projects for this one – so convenient. I love this, so cool product.